A bad scan of a title page from a set of pages done for an Egmont publisher. 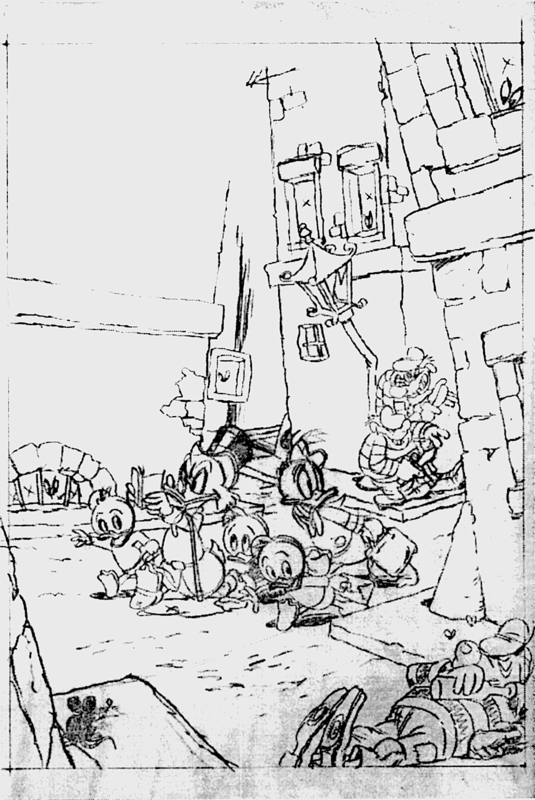 Samples of a Disney Duck Story that I am sure is lost and forgotten. This was done in 1993-95 - thereabouts. I was ecstatic at making a connection with Bob Foster (Art Director at the time for whatever branch of the European Disney publishers this was done for) and was learning a lot from his encouragement and feedback. 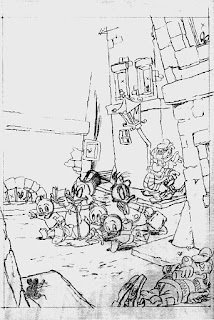 The possibility of actually working as a Disney comic artist was real at that time. Not long after this the revival of Duck Stories and other Disney comics fizzled out. I learned several things doing these pages. I cannot draw small. These were some standard sized comic page dimension. I need to draw at least twice this size. I also realized that the page rate for doing work like this would not be enough to pay my rent - let alone eat or afford any other modern convenience. I loved the idea of doing Disney duck comics. This was my highest ambition really. I had my heart in it - and I was pretty good at putting together the look and the feel. But… I could not live off it. For better or worse (who knows) - not becoming a new Duck Story artist was a major turning point in my career… I am sure I saved myself a lot of unnecessary stress. I am sure I traded that ambition for one that was better (marriage and family). I am sure I have not suffered much in terms of artistic expression… But I do still occasionally dream that old Duck Story artist/writer dream.